Part of the experience of dipping into old Doctor Who fanzines is seeing how fan prejudices were challenged by the experience of professionals. 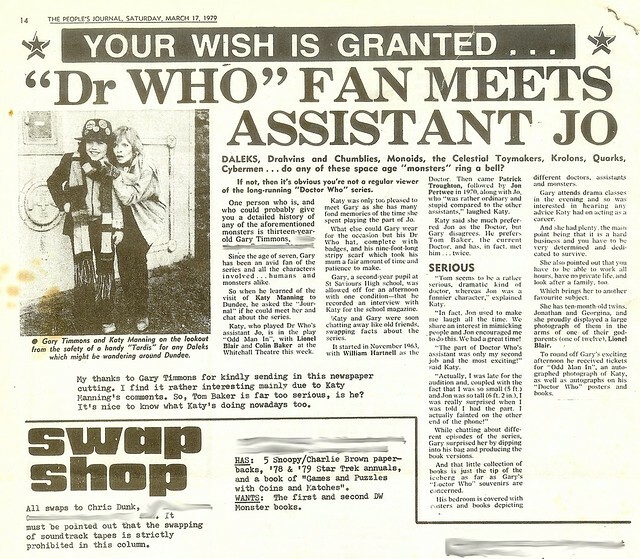 The editor of Celestial Toyroom (March 1980) reacted with some scepticism to a newspaper cutting from The People's Journal (Dundee) in which Katy Manning, six years after her departure from the series (the cutting was already a year old), described Tom Baker's Doctor as "a rather serious, dramatic kind of doctor, whereas Jon [Pertwee] was a funnier character." At this distance, with the doubtful wisdom of age and with the benefit of hindsight, many viewings and DVDs, I can see what Katy means; but I'm not surprised that in a period when very few people indeed had access to video recordings to compare the performances, and with many of the Doctor Who Appreciation Society writing as if they spent their evenings prowling Soho, ready to apprehend Tom Baker for turning 'their' series into a comedy, the teenage (I think) editor doubts Katy's assessment. Here's the article and picture, with a few addresses removed.